AOMEI Partition Assistant Server Edition is one the best application for partition manager, with this application you can easily partition your disk space especially for server. Many features that you will get if you are using this application such us Partition Resize, Partition Hard Disk, Partition/Disk Clone or Migration, etc. 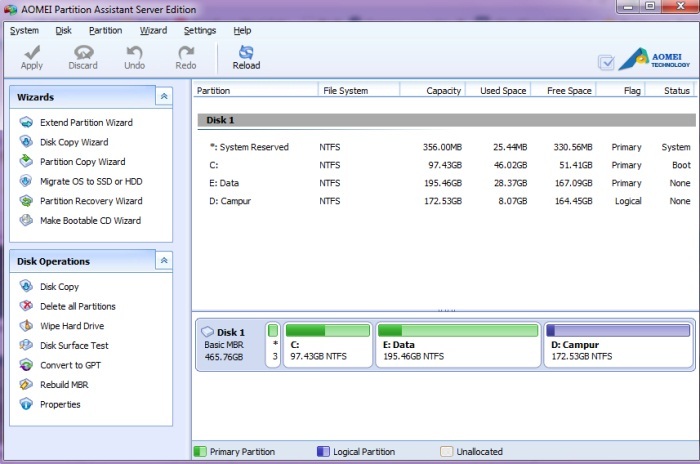 You can running AOMEI Partition Assistant Server Edition on Windows Server 2000, 2003, 2008 (R2 included), Windows Home Server 2011, Windows SBS 2003, 2008, 2011. Special for 2013 AOMEI Technology marketing department give AOMEI Partition Assistant Server Edition 5.1 license code for tricks-collections.com, this is for giveaway activity, so if you are lucky you can try this application for free. If you interested with Giveaway AOMEI Partition Assistant Server Edition 5.1 license code, please made a great comment here about AOMEI Partition Assistant Server Edition, I will send the license code to your email. Related to "Giveaway AOMEI Partition Assistant Server Edition 5.1 License Code"
I have used the pro version and it works very well, i certainly could use the server version as i run a home lab with a couple of servers for testing purposes and getting partitioning software that works on servers is expensive, as well as backup, imaging and defrag tools among others, so this would certainly be a very nice money saver. Nice one ,i find that server software is quite costly, i have server 2008 r2 on an old dell server that i am currently using to study for MS exam and this would be at the right price for a student. I used the free server version and it helped me quite often, when I want to resize my partitions or combine them. In the newest version it is also possible to convert a GPT Disk to a MBR Disk without data loss, but not in the free version. I want to convert some disks back to MBR, but normal tools can’t do this that easy. It would be nice to have a code so that I can use this feature. AOMEI Partition Assistant Server Edition is one of the best partition software. The free version is of great help. Thanks for the great giveaway. For shry, Jane & Riyaz: The license code sent to you. Thanks Fz, this an nice software. I hope it will solved quota problem. Very useful software, needed on each computer.